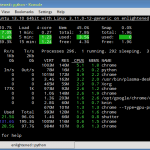 The ps command on linux is one of the most basic commands for viewing the processes running on the system. It provides a snapshot of the current processes along with detailed information like user id, cpu usage, memory usage, command name etc. 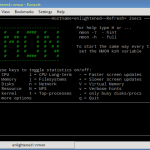 It does not display data in real time like top or htop commands. But even though being simpler in features and output it is still an essential process management/monitoring tool that every linux newbie should know about and learn well. In this post we are going to revise the basics of using the ps command to check the processes and filter and sort them in different ways to suit better. The ps command comes with an unusual set of 2 syntax styles. That is BSD and UNIX both. New users are often confused with and mis-interpret the two styles. So here is some basic info to get it clear before moving on. Note : "ps aux" is not the same as "ps -aux". For example "-u" is used to show process of that user. But "u" means show detailed information. BSD style - The options in bsd style syntax are not preceded with a dash. UNIX/LINUX style - The options in linux style syntax are preceded by a dash as usual. It is okay to mix both the syntax styles on linux systems. For example "ps ax -f". But in this post we shall mostly focus on the unix style syntax. Pipe the output to "less" to make it scrollable. Why is the USER column not displaying my username, but showing others like root, www-data etc ? For all usernames (including yours) if the length is greater than 8 characters then ps will fall back to show only the UID instead of username. To filter the processes by the owning user use the "-u" option followed by the username. Multiple usernames can be provided separated by a comma. To search the processes by their name or command use the "-C" option followed by the search term. To display processes by process id, use the "-p" option and provides the process ids separated by comma. System administrators often want to find out processes that are consuming lots of memory or CPU. The sort option will sort the process list based on a particular field or parameter. Multiple fields can be specified with the "--sort" option separated by a comma. Additionally the fields can be prefixed with a "-" or "+" symbol indicating descending or ascending sort respectively. There are lots of parameters on which the process list can be sorted. Check the man page for the complete list. Display the top 5 processes consuming most of the cpu. Many processes are actually forked out of some parent process, and knowing this parent child relationship is often helpful. The '--forest' option will construct an ascii art style tree view of the process hierarchy. The following command will search for processes by the name apache2 and construct a tree and display detailed information. Try not to use any sorting with the tree style display, as they both effect the order of display in different ways. Here is an example of finding all forked apache processes. The "-L" option will display the threads along with the processes. It can be used to display all threads of a particular process or all processes. The following command shall display all the threads owned by the process with id 3150. The output on my desktop is something like this. The output would be updated every 1 second to refresh the stats. However do not think that this is similar to top. 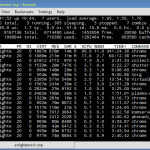 You would notice that the output of top/htop command changes much more frequently compared to the above ps command. This is because the top output sorts on a value that is a mix of cpu usage and memory usage. But the above ps command sorts in a more simpler manner, taking 1 column at a time (like school maths). So it would not update rapidly like top. Thanks for explanation. I usually use these ps commands. Thank you for you compilation, very useful. An example of how to add custom delimiters to the output would be great. Hello and thanks for the info. My question is about a top. how I can specify a process in top command. What I want to do is to monitor only two processes and want to specify those process and have the output continually stored in a text file. your 10. Turn ps into an realtime process viewer is great but I can’t save its output continually in a txt file. very good information and please improve some more details about this. Thanking you for all . Very informative. But how do you exit that real time process viewer please. Currently both systems accept any of the two forms. -e and au are equivalent and -f implies full listing while u in aux implies user oriented.